Originally published under the title "The Tolerable Level of Terrorism." The number of deaths from terrorism worldwide has increased ninefold since 2000. "Round up the usual suspects" was the brunt of President Obama's address to the American public after last week's San Bernardino massacre. Obama offered nothing new, only "airstrikes, Special Forces, and working with local forces who are fighting to regain control of their own country" in the Levant. Like his French counterpart Francois Hollande, Obama thinks that a certain level of terrorism is tolerable, and far preferable to the bloody and difficult work of rooting out jihadist terrorism entirely. There is something to be said for the notion of a tolerable level of terrorism, but neither Obama nor Hollande are likely to achieve this as matters stand. "Since the attacks in Paris," the President said, "we've surged intelligence-sharing with our European allies. We're working with Turkey to seal its border with Syria. And we are cooperating with Muslim-majority countries — and with our Muslim communities here at home — to counter the vicious ideology that ISIL promotes online." None of this is new and none of it is persuasive. Obama thinks a certain level of terrorism is far preferable to the bloody work of rooting out jihadism entirely. 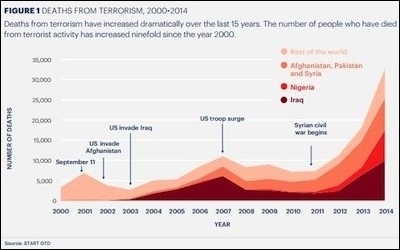 The trouble is that number of terrorist attacks is rising exponentially, along with the number of countries affected, according to the 2015 Terrorism Index of the Institute for Economics and Peace. The notion of a tolerable level of terrorism applied to a world in which Muslims killed each other far from the West. The recent attacks in Paris and California as well as Israel suggest that the old approach to containing terrorism has collapsed, along with the credibility of leaders who advanced it. More than 30,000 people died in terror attacks in 2014, compared to fewer than 8,000 in 2011. 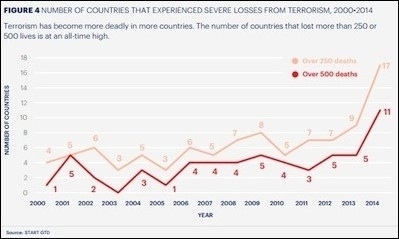 More important, 17 countries lost more than 250 people in terror attacks in 2014 vs. only 5 countries in 2011. The number killed and injured in suicide attacks (counted by the Chicago Project on Security and Terrorism) is trending sharply upward. The past year has brought almost as many casualties as the peak year of 2001—and is likely to get worse fast. Most of these attacks, to be sure, involve the mutual slaughter of Shia and Sunnis in the Middle East. But the Chicago statistics do not include attacks like the current wave of stabbings in Israel, in which the attackers know that they are likely to be killed, nor the San Bernardino brand of shooting attack. 17 countries lost more than 250 people in terror attacks in 2014. The 1998 and 2001 peaks in suicide terrorism capture the bombing of the US embassy in Nairobi and the 9/11 attack on the World Trade Center, respectively. There is today a much larger number and much greater geographic dispersion of suicide attacks. These numbers are striking, and suggest that the containment efforts of the last dozen years will continue to fail, as they failed in Paris and in California. It is too early to make definitive assertions about the changing character of terrorism, but here is a reasonable conjecture on the strength of available facts: It arises from despair in the Muslim world at the collapse of one Arab state after another (Libya, Syria, Iraq, Yemen), and at the mass humiliation of millions of Muslims begging at Europe's door. As in 1918, the Western powers (now joined by Russia) dicker over the fate of Syria and Iraq. There are thousands, perhaps hundreds of thousands or even millions of Muslims so enraged at their humiliation that they are willing to die in attacks on civilians. Palestine is an international issue. [The issue] won't be decided in a flurry of knives or acts of martyrdom [suicide attacks], or in protests or demonstrations. It will end only when the world understands it has a duty to intervene and to draw borders and lines, as it did in Bosnia-Herzegovina, in Kosovo ... One might ask: How long? And I say: The day will come. ... One might ask: Did the peaceful struggle bring about the end of the occupation? And I say: Did the military and armed struggle do so? .... Only the world can bring the solution. But it won't do so if we are silent, or if we commit suicide. It will [come to our rescue] if we stay on the humane path of our national struggle.... Our children grab kitchen knives in a wave of emotion. ... We must stand before them and say to them: You are destroying your lives and ours — Palestine needs you alive. He said he shared the ideology of al-Baghdadi to create an Islamic state, and he was fixed on Israel. I always told him, stay calm, be patient, in two years Israel won't exist any more. Geopolitics is changing–Russia, China, even America doesn't want anything to do with the Jews. Why fight? We tried it, and lost. You can't beat Israel with weapons, only with politics. But he didn't buy it. He was fixated. That is remarkable: after 35 years in the United States, the elder Farook still clung to the hope that Israel would disappear soon. His son, knowing better, decided to kill his co-workers, a strange way of attacking Israel, to be sure. How many more quiet, hard-working American Muslims will act on the same despair that drove Syed Farook and Tashfeen Malik to stockpile guns and bombs and slaughter a Christmas Party? The trouble is that the recognized leadership of Muslim communities in the United States harbors identical sentiments, although the vast majority of American Muslims want no part in violence. The Council on American-Islamic Relations (CAIR) drew an unusual amount of media attention when it called a press conference with members of the San Bernadino jihadists' families almost as soon as the news broke. The speed with which the organization acted is noteworthy; clearly it was prepared for damage control. Federal prosecutors in 2007 designated CAIR as an unindicted co-conspirator in a terrorist funding case. The Obama administration hopes that it can cut a deal with tractable Islamists. Like the Bush administration before it, the Obama administration hopes that it can cut a deal with tractable Islamists like the Muslim Brotherhood, which has become the most prominent Islamic organization in the United States through its affiliate the Council on American-Islamic Relations (CAIR). Not only Egypt, which overthrew a Muslim Brotherhood government in 2013, but also the United Arab Emirates lists CAIR as a terrorist organization. As Michelle Malkin reported in National Review Dec. 4, "Over the alleged objections of Dallas-area federal prosecutors, the Obama Justice Department's senior political appointees declined to press terror-financing charges against CAIR co-founder Omar Ahmad." The Obama administration, to be sure, evinces a different sort of sympathy for Muslims than its predecessor, conflating the self-styled "anti-colonialism" of radical Muslims with the American civil rights movement. Operationally, the policies of the past administrations are more similar than they are different. Islamist organizations like CAIR can provide a safety valve for Muslim rage, but can also become incubators for terrorists. Islamist organizations like CAIR and the Muslim Brotherhood can provide a safety valve for Muslim rage, but they also can become an incubator for prospective terrorists. Rather than contain violent impulses that may arise from extremist opinions, e.g., the destruction of the State of Israel or the founding of an Islamic Caliphate, the Muslim Brotherhood and its satellite organizations appear to have provided a screen for Tashfeen Malik to work herself up to the commission of terrorist acts. Malik wrote jihadist Facebook rants long before the shooting, her relatives in Pakistan told the Los Angeles Times. Not only US intelligence services but also several private organizations regularly collect data reflecting terrorist sentiments from Facebook, so the information had to have been in the hands of the FBI. Evidently the FBI did not find it alarming, probably because there is so much jihadist chatter on social media that intelligence agencies have become complacent. It is hard to explain to the American public why the United States spends $80 billion a year on intelligence—about the same as the entire national budget of Ireland or Poland—but fails to act on social media information of the sort that might have led the FBI to the Farook family arsenal. The answer is that such rants fall within the "normal" spectrum of views in the world of CAIR and its progenitor, the Muslim Brotherhood. For background, see the published work of my friends Daniel Pipes, president of the Middle East Forum, and Andrew McCarthy, the federal prosecutor in the first World Trade center bombing. US intelligence services tread lightly around Islamist organizations in the hope that Islamism will police itself. US intelligence services tread lightly around Islamist organizations in the hope that Islamism will eventually police itself. That is true in foreign policy as well as in domestic counter-terrorism, and it is as true of the Republican foreign policy establishment as it is of the Obama administration. South Carolina senator and presidential candidate Lindsey Graham went to Egypt in 2012 and endorsed a governmental role for the Muslim Brotherhood. A former head of the Central Intelligence Agency in a Republican administration told me that in Egypt, where the Muslim Brotherhood is banned as a terror organization, that Washington was disappointed at the overthrow of Brotherhood leader Mohammed Morsi in July 2013. "We wanted to see what would happen when the Brotherhood had to take responsibility for removing garbage," he said. Cultivating "good Islamists" (good because they refrain from violence even though they have the same sentiments and objectives as the terrorists) and "bad Islamists" (who actually kill people) was a dodgy approach to begin with. The trouble is that very large numbers of Muslims are willing to kill themselves in order to harm enemy noncombatants, and the number appears to be increasing. To my knowledge that is something new under the sun. Japanese kamikazes and Nizari assassins in the Middle Ages, like the pre-1917 Bolsheviks, were wiling to die to kill public officials or soldiers. But the murder of noncombatants through suicide attacks (or attacks likely to prove suicidal) is something we have never before witnessed. The alternative is to confront the Islamists rather than seeking to persuade some Islamists to police others. Sen. Ted Cruz (R-TX) proposed to designate the Brotherhood a Foreign Terrorist Organization in legislation filed Nov. 3; this measure would make CAIR's position untenable given its multiple connections to the Brotherhood and its affiliates. A substantial part of French opinion favors similar toughness, judging by the record 28% vote for her National Front in Sunday's regional elections. There is something to be said for a kind of modus vivendi with Islamists. Israel continues security cooperation with the Palestine Authority, which has perhaps 160,000 men under arms in its dozen-and-a-half security services, but has kept them (and their weapons) far from the fray. The result is a tolerable level of terrorism for the Israelis. As Haviv Rettig Gur observes, "The (terrorists') message is simple: stab the Jews, watch them scream, prove to yourself in that instant that they are mortal, vulnerable. For that brief moment – so the online campaign implicitly claims – Palestinian dignity is restored. Yet the real-world attacks that flow from this promise, the moments of frantic scuffling with Israelis, the quick deaths the attackers meet time and again, even when facing unarmed Israeli civilians, only bring the collapse of Palestinian solutions and self-respect – and Israeli unflappability – into sharper relief." A former head of Israel's military intelligence, Gen. Yaakov Amidror, warned last week that "massive retaliation" against Palestinian terrorists would make matters worse: "While there is no doubt that Israel is facing a difficult security situation, the surge in Palestinian violence does not pose any existential threat to Israel. Israel has weathered longer and harsher waves of terrorism. Israeli leaders must keep things in proportion and reject calls for 'massive retaliation' that will not truly improve security and could make things worse." Gen. Amidror served as Prime Minister Netanyahu's National Security Advisor. This sort of modus vivendi has an indispensable premise: Muslim community leaders must be persuaded that their interests lie in cooperating with security services rather than in abetting terrorists. In the United States, a few dozen Federal prosecutions and a hundred or so well-publicized deportations of prominent Muslims in the CAIR orbit would turn thousands of Muslim immigrants into willing snitches for the FBI. Most American Muslims are reasonably successful economic immigrants, and to the extent they share the Farook family's radical sentiments, they are not willing to give up their livelihoods to put them into practice. Sen. Cruz' proposal to designate the Muslim Brotherhood as a terrorist organization and turning the screws on its American sympathizers would preempt future attacks like the San Bernardino atrocity, and reduce the number of future attacks to a tolerable level. France's prospects are dimmer. Muslims comprise a tenth of the population. Two-fifths are unemployed and the overwhelming majority hold radical views. How Ms. Le Pen's National Front would confront a much larger, poorer and more radical Muslim population is not pleasant to contemplate.